So, in 2003, I started my journey of happiness and bliss with Yoga. Learning to integrate body, breath, mind and Soul in my daily practice. Remembering that Yoga is a Spiritual practice, otherwise it would be gymnastic. Every day, we are bombarded by “new kind of yoga”, but these practices have nothing to do with it. The name Yoga is used for marketing purposes, and this is not ok, in my opinion. So, we have to use right discrimination to understand what is Yoga and what is not, to stay away from practices that may seriously harm our bodies instead of keeping them young and healthy. You may be wondering how Yoga becomes a Spiritual practice, if we start from body postures? The answer is simple: when you connect deeply with your own body, you notice that there are emotions stuck there and you get a deeper connection with your true Self. You start controlling your mind, practicing meditation, so you can go beyond it. You no longer identify with your body and mind but you get a glimpse of your Soul. 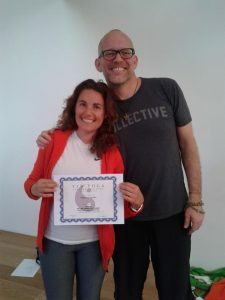 This is why a Yoga practice may lead you far, even if you started just because of a body condition (myself, I started because I had neck pain). Yoga brings true transformation into your life. You are not going to be the same anymore. This is not something that you can achieve at the gym, nor by posting fancy photos on social media. I am forever grateful to my Guru, Shri Yogi Hari, that thought me to appreciate the Bliss of authentic Yoga and that encourages me to continue in my Sadhana (my daily practice). Grateful also to my other great teacher Joe Barnett, for bringing to me the joy of Yin Yoga. Thank you also to all my students (the little ones and the more grown up ones) that are a constant source of ispiration and challenge for me. Have great holidays and practice, practice, practice! Passionate Yoga teacher, painter and lawyer, what a mix!! Congratulations for your success. Yoga takes patience and full mind control. Its only been a month i have started doing yoga. I know how difficult is that to stable our mind. But Yoga helps me a lot. I mean i can see a huge difference in my whole lifestyle now. Yoga can cure everything. Thanks for this motivational post. Absolutely true, that’s why I love yoga so much and for me it is definetly not only exercising. THank you for your comment, I appreciate that. Chiara, now I am feeling bad about the post I made on Facebook today which was, honestly, just an inside joke between myself and 3 other people that I mastermind with. All 4 of us having been serious athletes in our younger years, we often share fun outrageous fitness/dance videos we discover on the internet that we find humorous or entertaining. As I read your post I understand and acknowledge the serious nature of your message and appreciate your passionate plea. I want to let you know how much I appreciate it…and you. I am new to my yoga practice- just started this past year. But I chose it for for authentic connection with body, mind and spirit. My journey is only beginning, but I have been thrilled with how it makes me feel because it aligns perfectly with my True Health philosophy…which is entirely spiritual. So thank you for this blog, and for being the beautiful soul that you are! Thank you dear Lori for your comment on my post. I absolutely love gym, dance, aerobic! I have so much fun with it. So, nothing against that:) ,but of course, I do not like the inappropriate use of the word Yoga to promote things that have nothing to do with it. I find it sad..anyway, we are on the same line! Thank you again, I love receiving comments and feedback. A big hug to you accross the ocean.